The Orange County Ki Society is affiliated with Ki Society Headquarter in Japan through the Northwest Ki Federation. 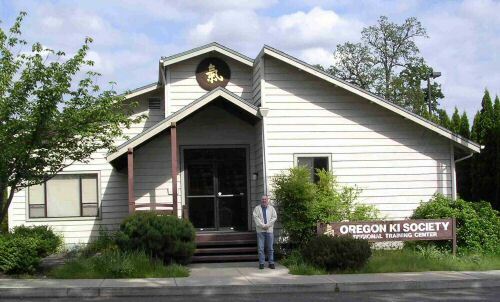 The headquarters dojo for the Northwest Ki Federation and the Oregon Ki Society is located in Portland, Oregon. This dojo is named Takushinkan Dojo or "Frontier" dojo. This name was presented to the dojo by Tohei Sensei when he lead the official grand opening ceremony in 1997. He also penned a plaque for the occasion which is displayed at the dojo. The training facilities include a large tatami training area, full dressing rooms with showers, a general purpose area for meetings and socializing, a small Japanese-style tatami room and a kitchen. The Personal Kiatsu School resides in a separate building next door. This second facility contains a training area, full dressing rooms and another kitchen. 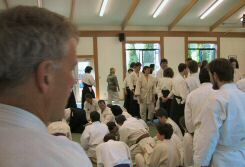 During camps and seminars all classes are held in the dojo. Group meals are prepared and served at the Kiatsu School, which is next door. The dojo has a large number of foam mattresses that many "out of towners" use to stay at the dojo in sleeping bags. For the less hardy there are several hotels nearby. Generally camps begin on Saturday morning at 9:00 AM. Classes continue throughout the day until about 9:00 PM that night. There are breaks in the schedule for meals which are eaten together as a group. Meals are always included in the camp fees. On Sunday morning there is usually an early morning class and training continues until about 3:00 PM. Again, there are breaks for meals. The training at camps covers the full range of the Ki Society curriculum. 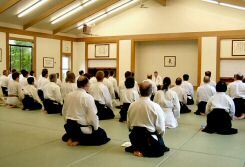 There are generally Ki classes, Aikido classes and a Kiatsu session. There is a general emphasis on understanding the fundamentals of training more deeply. Below are some interior and exterior photos of the dojo. 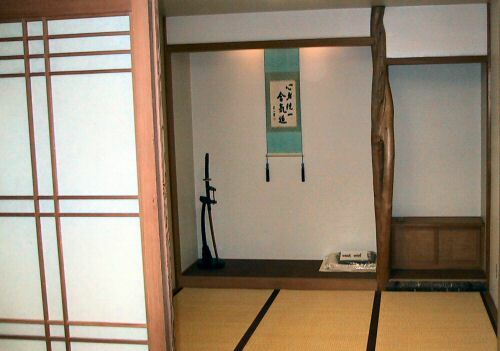 Tatami room in Takushinkan Dojo. 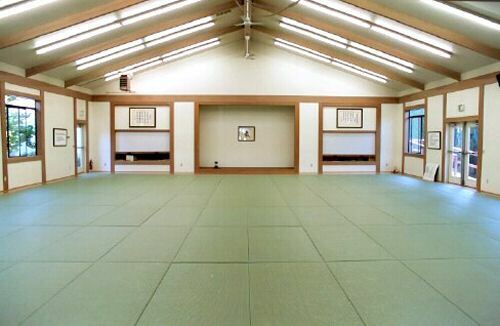 Training area in Takushinkan Dojo. Front entrance of Takushinkan Dojo.